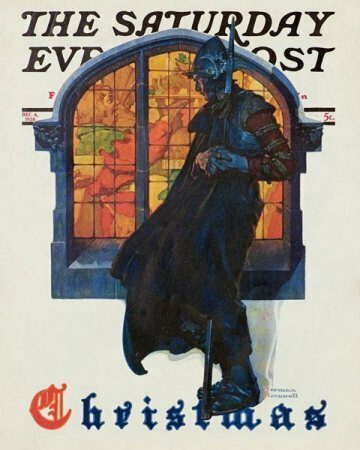 Norman Rockwell's Christmas: Knight Looking In Stained Glass Window appeared on the cover of The Saturday Evening Post published December 6, 1930. The original oil on canvas painting, 48 x 30 inches or 122 x 76 cm, is located in a private collection. This painting was Rockwell's 131st overall of 322 total pictures featured on the cover of The Post. Rockwell's career with the Post spanned 47 years, from his first cover illustration, Boy With Baby Carriage in 1916 to his last, Portrait of John F. Kennedy, in 1963. This was also the ninth Rockwell cover in 1930. The Post featured a Rockwell illustration on its cover nine times in 1930.
on page 120 of Norman Rockwell, A Definitive Catalogue by Laurie Norton Moffatt. Your question, "What does this painting have to do with Christmas?" is a very reasonable question. One needs to study the painting to notice all the holiday references. The main character is, of course, the knight. He is standing watch outside at Christmas. It is cold and dark outside. A layer of frozen snow rests on the top of the window casing. The wind is blowing his coat. He stands with his back to the wind, gazing through the window. The knight is not wearing any Christmas finery. He is also not doing a great job of guarding. He is distracted by the scene inside the window. He is missing the party. Christmas: Knight Looking In Stained Glass Window was only one of 322 Norman Rockwell Saturday Evening Post covers; Here is the list of Norman Rockwell Saturday Evening Post cover illustrations. The knight's facial expression make him seem envious of those people inside at the party. Who wouldn't want to be inside with his friends instead of stuck outside in the cole pulling guard duty? The scene inside shows us how Christmas was celebrated during the time period Rockwell is painting. Rockwell was meticulous about authenticity. You can be sure that this is what a Christmas party looked like back then. Through the window, we notice a feast. We also can see the partiers dressed in their Christmas finery. Poor knight. He should stop torturing himself and move along.